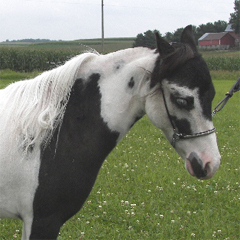 Havencrofts Phantom Warrior, our wonderful 31" AMHA/AMHR black pinto herd sire is lab tested HOMOZYGOUS for tobiano, which means that he will ALWAYS produce PINTO foals no matter what color mare he is bred to. "Phantom" has one blue eye and appears to carry a splash and sabino gene and will be tested for overo also. We look forward to his colorful foals and will expect homozygous pinto foals also as we have homozygous pinto mares in our herd. Many thanks to Anne and Noel Veglahn of Havencroft Miniatures for allowing us to purchase this handsome stallion. Below are a few sites worth visiting: "The American Miniature Horse Association"